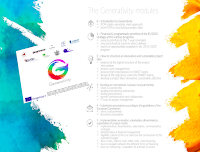 Together with the staff & organizations of the Generativity project, I am proud to launch the online version of the six training modules (IO2) on Project Cycle Management in the six project languages: English, Italian, Polish, Greek, Dutch and French. The modules cover all the fundamental issues to lead you through a learning path to Project Cycle Management to strengthen the social and educational communities in a 2.0 environments. Our goal is to generate and support a wide new generation of third sector organizations int their path to the creation, development and implementation of sustainable and effective European projects. an easy-to-understand first touch for the PCM beginners, with practical tips to support on specific issues. addictional exhaustive notes to improve both the individual and collective skills of those who are already experienced. These training materials on PCM represent the evolution of the original concept that I created with Federica Cadeddu some years ago, and which I used in various consultancies with private and public bodies in the Italian scenario. The modules have been firstly implemented with my colleagues in Diciannove, then we tested them on our staff during a collective LTTA training event. Following the precise evaluation conducted by Dave Oborne from EEC, we re-worked them in order to maximize their efficacy. The modules were then divided among Diciannove, Danmar Computers, Cardet, EEC, University of Thessaly, KEA: some slides were refreshed; others were modified; practical tips and suggestions were incorporated; notes were added to each slide to make them even more specific and exhaustive. Then it came the time for the final testing by the students of the University of Thessaly. The last stage was run by Danmar Computers, who edited and refined them to be ready for the IT environment in the form you now see. The training module slides are composed of two parts: the body (focusing on key-points) and the associated notes (which give more details, explanations and tips). The body of the slides is in English to promote the knowledge of the terminology and glossary from the perspective of an EU Commission. The notes are translated into partner languages to provide a more effective understanding of the major points in the slides. It was a great effort for us to implement these modules, and we are proud of the results which we achieved. In the next weeks we will finalize the modules in order for you to freely download them straight on your IT devices.